More airplane manufacturing jobs are likely coming to the Mobile area. Mobile is currently the site of an assembly line for French airplane manufacturer Airbus, and it may be getting a second one. That news follows a deal giving Airbus a majority stake in the C series aircraft from Canadian plane maker Bombardier. The C series is similar to the A-320 and A-321 aircraft already manufactured in Mobile. Airbus says they plan to open an assembly line in south Alabama to manufacture the C series planes. The University of Alabama will welcome an Airbus A321 commercial airliner for a pregame flyover prior to the start of the Iron Bowl on Saturday at Bryant-Denny Stadium. European aircraft maker Airbus says the inaugural test flight of its first airplane made in the United States was a success. The A321 passenger jet took off this morning from the company's new plant in Mobile. The three-hour flight over the Gulf of Mexico included a series of maneuvers and tests of all the airplane's operating systems. The first Airbus produced by the company’s U.S. Manufacturing Facility in Mobile is set to take the skies for the first time next week. The Alabama-built A321 plane will take off from the Mobile Airport at 9:15 Monday morning barring any weather or other pre-flight test factors. The future JetBlue Airbus’s test flight is a normal step in aircraft production and takes place before the company gets the plane. Following the flight, the aircraft will go through a few more weeks of final delivery preparations. Tourism in Mobile Expected to Boom. The future looks bright for the tourism industry in Mobile. City leaders are touting the return of Carnival Cruise Lines to the city next year, the new GulfQuest Maritime Museum just opened near the downtown cruise terminal, and the region's is economy looks good. Despite its rich history, antebellum architecture and emerging art and music scene, locals say Mobile has long been overlooked by tourists heading west to New Orleans or east to the Florida Panhandle. Indicted House Speaker Mike Hubbard has given a litany of complaints about his case in a recently unsealed document. Hubbard says the state’s ethics law is unconstitutionally vague, did not apply to him as Republican party chairman and that he had a free speech right to lobby for his clients. Late last week, a judge unsealed Hubbard's motion to dismiss his ethics case on the grounds that the ethics law is unconstitutional. Hundreds of people gathered at APM Terminals in Mobile yesterday to celebrate the final transport of the first major A320 components from the Port of Mobile to the Airbus U.S. Manufacturing Facility. The large plane parts arrived yesterday afternoon amid fanfare and a parade. 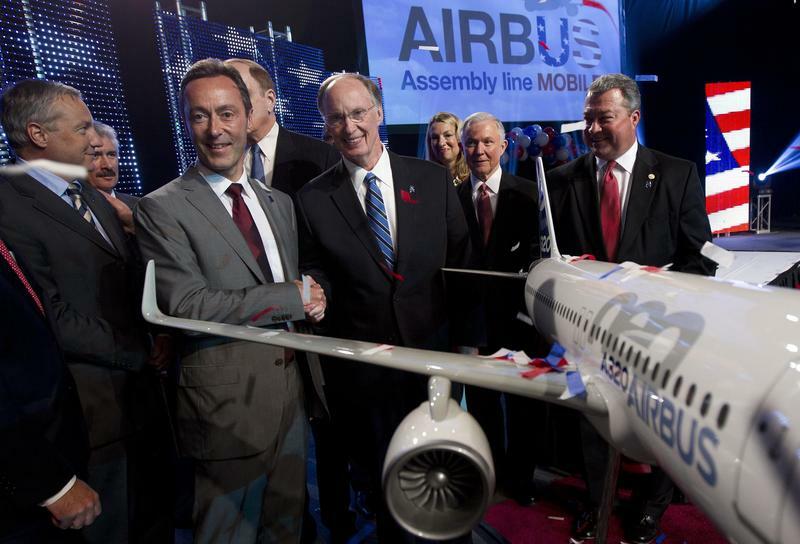 Airbus announced three years ago that Mobile will house the planemaker's first final assembly line on U.S. soil. Legislation to help protect Airbus from lawsuits involving planes built at the new plant in Mobile has moved closer to final passage in the Alabama Legislature. The House voted unanimously Thursday for the bill that places a 12-year limit on filing lawsuits as a result of an accident involving a plane built at the new plant. A lawsuit would have to involve a problem with the airplane that arose within 12 years of when the plane was sold. Airbus, the European aviation giant, announced that it was opening its first assembly plant in the United States. The AP reports this is a significant and symbolic step in its rivalry with the American Boeing. "The French-based company said the Alabama plant is expected to cost $600 million to build and will employ 1,000 people when it reaches full production, likely to be four planes a month by 2017.